Gors Fawr circle looking northwards. The Preseli Mountains are the hills to the right of the picture. The 2 outliers seen from the south. This is an area rich in burial chambers, cairn and standing stones and on a flat plateau of moorland whose name translates as 'great wasteland' stands the beautiful stone circle of Gors Fawr. 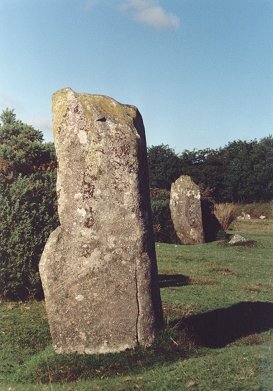 It consists of 16 small remaining stones whose heights rise towards the south - although none rise above a metre in height, the circle having a diameter of around 22 metres. The siting of this circle is particularly interesting as it lies just to the south of the Preseli Mountains - these hills being the place where the Stonehenge bluestones originated. Despise this close proximity to the source of these supposed sacred stones, only one was used in the making of this circle, the rest are composed of local glacial erratic boulders. At 134 metres to the northeast are a pair of standing stones both nearly 2 metres tall and set 14 metres apart - one of them is known locally as the 'Dreaming Stone'. Their southwest to northeast alignment has lead some to suggest that these outliers may be connected to the midsummer sunrise. The circle dates from the Neolithic or early Bronze Age.